OSGi frameworks are often used in places where end users or devices initiate actions. These kinds of actions inevitably create a need for authenticating the initiator. Authenticating can be done in many different ways, including with passwords, one-time token cards, biometrics, and certificates. Once the initiator is authenticated, it is necessary to verify that this principal is authorized to perform the requested action. This authorization can only be decided by the operator of the OSGi environment, and thus requires administration. The User Admin service provides this type of functionality. Bundles can use the User Admin service to authenticate an initiator and represent this authentication as an Authorization object. Bundles that execute actions on behalf of this user can use the Authorization object to verify if that user is authorized. The User Admin service provides authorization based on who runs the code, instead of using the Java code-based permission model. See  The Java Security Architecture for JDK 1.2. It performs a role similar to  Java Authentication and Authorization Service. Authentication - A large number of authentication schemes already exist, and more will be developed. The User Admin service must be flexible enough to adapt to the many different authentication schemes that can be run on a computer system. Authorization - All bundles should use the User Admin service to authenticate users and to find out if those users are authorized. It is therefore paramount that a bundle can find out authorization information with little effort. Security - Detailed security, based on the Framework security model, is needed to provide safe access to the User Admin service. It should allow limited access to the credentials and other properties. Extensibility - Other bundles should be able to build on the User Admin service. It should be possible to examine the information from this service and get real-time notifications of changes. Properties - The User Admin service must maintain a persistent database of users. It must be possible to use this database to hold more information about this user. Administration - Administering authorizations for each possible action and initiator is time-consuming and error-prone. It is therefore necessary to have mechanisms to group end users and make it simple to assign authorizations to all members of a group at one time. User Admin - This interface manages a database of named roles which can be used for authorization and authentication purposes. Role - This interface exposes the characteristics shared by all roles: a name, a type, and a set of properties. User - This interface (which extends Role) is used to represent any entity which may have credentials associated with it. These credentials can be used to authenticate an initiator. Group - This interface (which extends User) is used to contain an aggregation of named Role objects (Group or User objects). Authorization - This interface encapsulates an authorization context on which bundles can base authorization decisions. User Admin Event - This class is used to represent a role change event. User Admin Listener - This interface provides a listener for events of type UserAdminEvent that can be registered as a service. User Admin Permission - This permission is needed to configure and access the roles managed by a User Admin service. Role.USER_ANYONE - This is a special User object that represents any user, it implies all other User objects. It is also used when a Group is used with only basic members. The Role.USER_ANYONE is then the only required member. An Operator uses the User Admin service to define OSGi framework users and configure them with properties, credentials, and roles. User - A User object can be configured with credentials, such as a password, and properties, such as address, telephone number, and so on. Group - A Group object is an aggregation of basic and required roles. Basic and required roles are used in the authorization phase. An OSGi framework can have several entry points, each of which will be responsible for authenticating incoming requests. An example of an entry point is the Http Service, which delegates authentication of incoming requests to the handleSecurity method of the HttpContext object that was specified when the target servlet or resource of the request was registered. The OSGi framework entry points should use the information in the User Admin service to authenticate incoming requests, such as a password stored in the private credentials or the use of a certificate. A bundle can determine if a request for an action is authorized by looking for a Role object that has the name of the requested action. The bundle may execute the action if the Role object representing the initiator implies the Role object representing the requested action. X implies all of A's required members. A and X are equal. The Authorization class handles this non-trivial logic. The User Admin service can capture the privileges of an authenticated User object into an Authorization object. The Authorization.hasRole method checks if the authenticate User object has (or implies) a specified action Role object. For example, in the case of the Http Service, the HttpContext object can authenticate the initiator and place an Authorization object in the request header. The servlet calls the hasRole method on this Authorization object to verify that the initiator has the authority to perform a certain action. See Authentication. A secret known only to the initiator. Knowledge about cards that can generate a unique token. Public information like certificates of trusted signers. Information about the user that can be measured in a trusted way. The User Admin service offers a repository of Role objects. Each Role object has a unique name and a set of properties that are readable by anyone, and are changeable when the changer has the UserAdminPermission. Additionally, User objects, a sub-interface of Role, also have a set of private protected properties called credentials. Credentials are an extra set of properties that are used to authenticate users and that are protected by UserAdminPermission. Properties are accessed with the Role.getProperties() method and credentials with the User.getCredentials() method. Both methods return a Dictionary object containing key/value pairs. The keys are String objects and the values of the Dictionary object are limited to String or byte[ ] objects. This specification does not define any standard keys for the properties or credentials. The keys depend on the implementation of the authentication mechanism and are not formally defined by OSGi specifications. If multiple User objects have the same property (key and value), a null is returned. There is a convenience method to verify that a user has a credential without actually getting the credential. This is the User.hasCredential(String,Object) method. Access to credentials is protected on a name basis by UserAdminPermission. Because properties can be read by anyone with access to a User object, UserAdminPermission only protects change access to properties. The following example shows a very simple authentication algorithm based on passwords. The vendor of the authentication bundle uses the property "com.acme.basic-id" to contain the name of a user as it logs in. This property is used to locate the User object in the repository. Next, the credential "com.acme.password" contains the password and is compared to the entered password. If the password is correct, the User object is returned. In all other cases a SecurityException is thrown. Authentication based on certificates does not require a shared secret. Instead, a certificate contains a name, a public key, and the signature of one or more signers. The name in the certificate can be used to locate a User object in the repository. Locating a User object, however, only identifies the initiator and does not authenticate it. The first step to authenticate the initiator is to verify that it has the private key of the certificate. Next, the User Admin service must verify that it has a User object with the right property, for example "com.acme.certificate"="Fudd". The next step is to see if the certificate is signed by a trusted source. The bundle could use a central list of trusted signers and only accept certificates signed by those sources. Alternatively, it could require that the certificate itself is already stored in the repository under a unique key as a byte in the credentials. In any case, once the certificate is verified, the associated User object is authenticated. 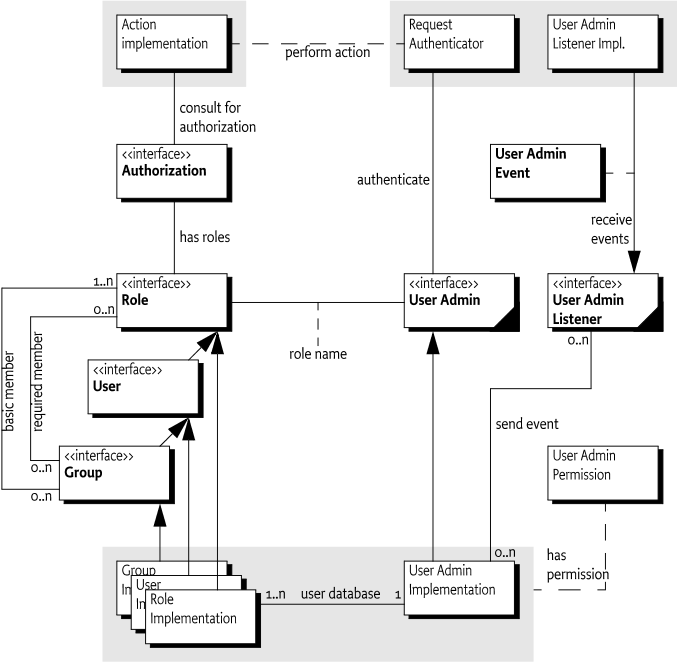 The User Admin service authorization architecture is a role-based model. In this model, every action that can be performed by a bundle is associated with a role. Such a role is a Group object (called group from now on) from the User Admin service repository. For example, if a servlet could be used to activate the alarm system, there should be a group named AlarmSystemActivation. The operator can administrate authorizations by populating the group with User objects (users) and other groups. Groups are used to minimize the amount of administration required. For example, it is easier to create one Administrators group and add administrative roles to it rather than individually administer all users for each role. Such a group requires only one action to remove or add a user as an administrator. Any of the four members Elmer, Pepe, Daffy, or Bugs can activate the alarm system. Alternatively, an initiator could be allowed to perform an action (represented by a Group object) if it implied all the Group object's members. In this case, using the same AlarmSystemActivation group, only Elmer and Pepe would be authorized to activate the alarm system, since Daffy and Bugs are not members of both the Administrators and Family Group objects. The User Admin service supports a combination of both strategies by defining both a set of basic members (any) and a set of required members (all). The difference is made when Role objects are added to the Group object. To add a basic member, use the Group.addMember(Role) method. To add a required member, use the Group.addRequiredMember(Role) method. Basic members define the set of members that can get access and required members reduce this set by requiring the initiator to imply each required member. If only required members are used to qualify the implication, then the standard user Role.USER_ANYONE can be obtained from the User Admin service and added to the Group object. This Role object is implied by anybody and therefore does not affect the required members. The complexity of authorization is hidden in an Authorization class. Normally, the authenticator should retrieve an Authorization object from the User Admin service by passing the authenticated User object as an argument. This Authorization object is then passed to the bundle that performs the action. This bundle checks the authorization with the Authorization.hasRole(String) method. The performing bundle must pass the name of the action as an argument. The Authorization object checks whether the authenticated user implies the Role object, specifically a Group object, with the given name. This is shown in the following example. This section demonstrates a possible use of the User Admin service. The service has a flexible model and many other schemes are possible. Installing and uninstalling bundles could potentially extend this set. Therefore, the Operator also defines a number of groups that can be used to contain the different types of system users. First, the residents and buddies are assigned to the system user groups. Second, the user groups need to be assigned to the action groups. The following tables show how the groups could be assigned. The UserAdmin interface is a straightforward API to maintain a repository of User and Group objects. It contains methods to create new Group and User objects with the createRole(String,int) method. The method is prepared so that the same signature can be used to create new types of roles in the future. The interface also contains a method to remove a Role object. The existing configuration can be obtained with methods that list all Role objects using a filter argument. This filter, which has the same syntax as the Framework filter, must only return the Role objects for which the filter matches the properties. Several utility methods simplify getting User objects depending on their properties. Changes in the User Admin service can be determined in real time. Each User Admin service implementation must send a UserAdminEvent object to any service in the Framework service registry that is registered under the UserAdminListener interface. This event must be send asynchronously from the cause of the event. The way events must be delivered is the same as described in Delivering Events of OSGi Core Release 7. This procedure is demonstrated in the following code sample. It is not necessary to unregister the listener object when the bundle is stopped because the Framework automatically unregisters it. Once registered, the UserAdminListener object must be notified of all changes to the role repository. event - (UserAdminEvent) The event that was broadcast by the User Admin service. role - (Role) The Role object that was created, modified or removed. role.name - (String) The name of the role. role.type - (Integer) One of ROLE, USER or GROUP. service - (ServiceReference) The Service Reference of the User Admin service. service.id - (Long) The User Admin service's ID. The User Admin service is related to the security model of the OSGi framework, but is complementary to the  The Java Security Architecture for JDK 1.2. The final permission of most code should be the intersection of the Java 2 Permissions, which are based on the code that is executing, and the User Admin service authorization, which is based on the user for whom the code runs. changeProperty - This permission is required to modify properties. The name of the permission is the prefix of the property name. changeCredential - This action permits changing credentials. The name of the permission is the prefix of the name of the credential. getCredential - This action permits getting credentials. The name of the permission is the prefix of the credential. If the name of the permission is "admin", it allows the owner to administer the repository. No action is associated with the permission in that case. Otherwise, the permission name is used to match the property name. This name may end with a ". *" string to indicate a wildcard. For example, com.acme. * matches com.acme.fudd.elmer and com.acme.bugs. At a glance, the Java Authorization and Authentication Service (JAAS) seems to be a very suitable model for user administration. The OSGi organization, however, decided to develop an independent User Admin service because JAAS was not deemed applicable. The reasons for this include dependency on Java SE version 1.3 ("JDK 1.3") and existing mechanisms in the previous OSGi Service Gateway 1.0 specification. The authorization component of JAAS relies on the java.security.DomainCombiner interface, which provides a means to dynamically update the ProtectionDomain objects affiliated with an AccessControlContext object. This interface was added in JDK 1.3. In the context of JAAS, the SubjectDomainCombiner object, which implements the DomainCombiner interface, is used to update ProtectionDomain objects. The permissions of ProtectionDomain objects depend on where code came from and who signed it, with permissions based on who is running the code. Leveraging JAAS would have resulted in user-based access control on the OSGi framework being available only with JDK 1.3, which was not deemed acceptable. JAAS provides a plugable authentication architecture, which enables applications and their underlying authentication services to remain independent from each other. The Http Service already provides a similar feature by allowing servlet and resource registrations to be supported by an HttpContext object, which uses a callback mechanism to perform any required authentication checks before granting access to the servlet or resource. This way, the registering bundle has complete control on a per-servlet and per-resource basis over which authentication protocol to use, how the credentials presented by the remote requester are to be validated, and who should be granted access to the servlet or resource. The authorization component relies on group membership information to be stored and managed outside JAAS. JAAS does not manage persistent information, so the User Admin service can be a provider of group information when principals are assigned to a Subject object. The authorization component allows for credentials to be collected and verified, but a repository is needed to actually validate the credentials. In the future, the User Admin service can act as the back-end database to JAAS. The only aspect JAAS will remove from the User Admin service is the need for the Authorization interface. Authorization - The Authorization interface encapsulates an authorization context on which bundles can base authorization decisions, where appropriate. Group - A named grouping of roles (Role objects). Role - The base interface for Role objects managed by the User Admin service. User - A User role managed by a User Admin service. UserAdmin - This interface is used to manage a database of named Role objects, which can be used for authentication and authorization purposes. UserAdminEvent - Role change event. UserAdminListener - Listener for UserAdminEvents. UserAdminPermission - Permission to configure and access the Role objects managed by a User Admin service. □ Gets the name of the User that this Authorization context was created for. Returns The name of the User object that this Authorization context was created for, or null if no user was specified when this Authorization context was created. □ Gets the names of all roles implied by this Authorization context. Returns The names of all roles implied by this Authorization context, or null if no roles are in the context. The predefined role user.anyone will not be included in this list. name The name of the role to check for. □ Checks if the role with the specified name is implied by this Authorization context. Returns true if this Authorization context implies the specified role, otherwise false. role The role to add as a basic member. □ Adds the specified Role object as a basic member to this Group object. Returns true if the given role could be added as a basic member, and false if this Group object already contains a Role object whose name matches that of the specified role. Throws SecurityException– If a security manager exists and the caller does not have the UserAdminPermission with name admin. role The Role object to add as a required member. □ Adds the specified Role object as a required member to this Group object. Returns true if the given Role object could be added as a required member, and false if this Group object already contains a Role object whose name matches that of the specified role. □ Gets the basic members of this Group object. Returns The basic members of this Group object, or null if this Group object does not contain any basic members. □ Gets the required members of this Group object. Returns The required members of this Group object, or null if this Group object does not contain any required members. role The Role object to remove from this Group object. □ Removes the specified Role object from this Group object. Returns true if the Role object could be removed, otherwise false. 107.8.4.4 public static final String USER_ANYONE = "user.anyone"
□ Returns the name of this role. □ Returns a Dictionary of the (public) properties of this Role object. Any changes to the returned Dictionary will change the properties of this Role object. This will cause a UserAdminEvent object of type UserAdminEvent.ROLE_CHANGED to be broadcast to any UserAdminListener objects. Returns Dictionary containing the properties of this Role object. □ Returns the type of this role. □ Returns a Dictionary of the credentials of this User object. Any changes to the returned Dictionary object will change the credentials of this User object. This will cause a UserAdminEvent object of type UserAdminEvent.ROLE_CHANGED to be broadcast to any UserAdminListeners objects. Returns Dictionary object containing the credentials of this User object. □ Checks to see if this User object has a credential with the specified key set to the specified value. Returns true if this user has the specified credential; false otherwise. Throws SecurityException– If a security manager exists and the caller does not have the UserAdminPermission named after the credential key (or a prefix of it) with action getCredential. name The name of the Role object to create. type The type of the Role object to create. Must be either a Role.USER type or Role.GROUP type. □ Creates a Role object with the given name and of the given type. Returns The newly created Role object, or null if a role with the given name already exists. Throws IllegalArgumentException– if type is invalid. SecurityException– If a security manager exists and the caller does not have the UserAdminPermission with name admin. user The User object to create an Authorization object for, or null for the anonymous user. □ Creates an Authorization object that encapsulates the specified User object and the Role objects it possesses. The null user is interpreted as the anonymous user. The anonymous user represents a user that has not been authenticated. An Authorization object for an anonymous user will be unnamed, and will only imply groups that user.anyone implies. Returns the Authorization object for the specified User object. name The name of the Role object to get. □ Gets the Role object with the given name from this User Admin service. Returns The requested Role object, or null if this User Admin service does not have a Role object with the given name. filter The filter criteria to match. □ Gets the Role objects managed by this User Admin service that have properties matching the specified LDAP filter criteria. See org.osgi.framework.Filter for a description of the filter syntax. If a null filter is specified, all Role objects managed by this User Admin service are returned. Returns The Role objects managed by this User Admin service whose properties match the specified filter criteria, or all Role objects if a null filter is specified. If no roles match the filter, null will be returned. Throws InvalidSyntaxException– If the filter is not well formed. key The property key to look for. value The property value to compare with. □ Gets the user with the given property key-value pair from the User Admin service database. This is a convenience method for retrieving a User object based on a property for which every User object is supposed to have a unique value (within the scope of this User Admin service), such as for example a X.500 distinguished name. Returns A matching user, if exactly one is found. If zero or more than one matching users are found, null is returned. name The name of the Role object to remove. □ Removes the Role object with the given name from this User Admin service and all groups it is a member of. Returns true If a Role object with the given name is present in this User Admin service and could be removed, otherwise false. ref The ServiceReference object of the User Admin service that generated this event. role The Role object on which this event occurred. □ Constructs a UserAdminEvent object from the given ServiceReference object, event type, and Role object. □ Gets the Role object this event was generated for. Returns The Role object this event was generated for. □ Gets the ServiceReference object of the User Admin service that generated this event. Returns The User Admin service's ServiceReference object. □ Returns the type of this event. □ Receives notification that a Role object has been created, removed, or modified. 107.8.9.1 public static final String ADMIN = "admin"
107.8.9.2 public static final String CHANGE_CREDENTIAL = "changeCredential"
107.8.9.3 public static final String CHANGE_PROPERTY = "changeProperty"
107.8.9.4 public static final String GET_CREDENTIAL = "getCredential"
□ Creates a new UserAdminPermission with the specified name and actions. name is either the reserved string "admin" or the name of a credential or property, and actions contains a comma-separated list of the actions granted on the specified name. Valid actions are changeProperty,changeCredential, and getCredential. Throws IllegalArgumentException– If name equals "admin" and actions are specified. obj the object to be compared for equality with this object. □ Checks two UserAdminPermission objects for equality. Checks that obj is a UserAdminPermission, and has the same name and actions as this object. Returns true if obj is a UserAdminPermission object, and has the same name and actions as this UserAdminPermission object. □ Returns the canonical string representation of the actions, separated by comma. □ Returns the hash code value for this object. p the permission to check against. □ Checks if this UserAdminPermission object "implies" the specified permission. Returns true if the specified permission is implied by this object; false otherwise. □ Returns a new PermissionCollection object for storing UserAdminPermission objects. Returns a new PermissionCollection object suitable for storing UserAdminPermission objects. □ Returns a string describing this UserAdminPermission object. This string must be in PermissionInfo encoded format. Returns The PermissionInfo encoded string for this UserAdminPermission object.